Is there anything more dramatic than the giant Farmer John Dahlia’s dinner-plate-sized 10-inch white bloom? 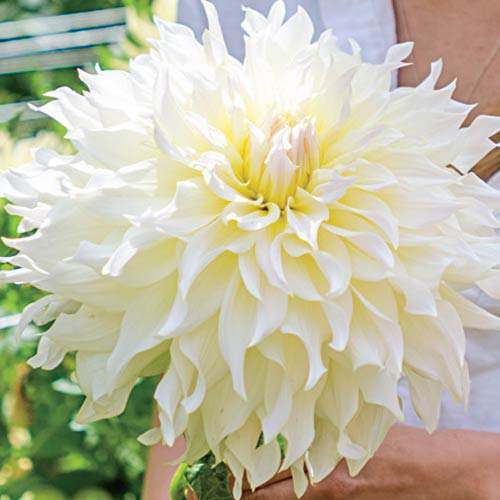 The bloom size alone is remarkable, but its hints of lime green and yellow make Farmer John Dahlias a must-have for gardeners who want to impress their friends. Add complementary flowers and a bit of strategically placed decor and your garden moves beyond the typical into the extraordinary. Today’s flower gardeners have so many choices, it’s hard to decide. If you want something different than the norm, you’re in luck. There are some beguiling choices that are sure to give your garden a one-of-a-kind look. Celosia is an annual in most zones. It is an eye-catching, plumed, crested or spiked plant with boldly colored flowers. Colors include cream, yellow, orange, red, deep magenta and pink. Celosia is low-maintenance, easy to grow from seed and hardy. Celosia is ideal for border areas and adds bright color and texture to any garden space. Amaranth, also called Love Lies Bleeding, is perfect for borders. Its exotic, color-rich blooms are favorites for drying, but it’s in the garden where it truly shines. Depending on the variety you choose, the velvety flowers either stand upright in spikes or drop down in glorious pendulous formations. Flower-of-an-Hour, or hibiscus trionum, is a pretty little flower that is a great flower bed filler. Seldom seen in gardens, its leaves are dark green and provide a textural contrast to the enchanting creamy purple-hued petals and burgundy centers. An interesting fact about Flower-of-an-Hour is that each bloom lasts only one day, but the plant itself blooms profusely. The short life of the bloom is hardly noticeable. If you have the space, Bee Balm not only produces spectacular crimson blooms, it attracts bees, butterflies and hummingbirds. A member of the mint family, additional color choices include white, pink, blue and purple. Bee Balm spreads aggressively, but is not considered invasive. It grows from 2 feet to 4 feet high. The South African Foxglove blooms from midsummer to fall. Flowers hang in clusters and come in shades of pink and white, with violet striping. Drought and deer resistant, the South African Foxglove looks best when planted with shrubs and dark-colored foliage. Trailing Nasturtium adds dramatic color and style. Ideal for flower bed edges or ground cover, Trailing Nasturtium can be trained to climb fences and trellises. An added benefit? In a pinch, you can eat the flowers and plants. Every flower gardener, from budding to old pro, hears about techniques that supposedly make plants grow better. Some, such as planning your placement so that shorter plants are not overshadowed by taller ones, are just common sense. Others, however, stretch the imagination. Sprinkle your garden with blood. Not yours, thankfully. You can purchase bloodmeal, which is made of animal blood. Some gardeners believe the fertilizing properties of bloodmeal are phenomenal and tout its pest deterrent abilities. Egg shells make great fertilizer. Egg shells are full of calcium carbonate, an essential ingredient for healthy soil. It’s best to completely crush shells in a blender before using them in the garden.Do you want sweeter cucumbers? Plant them next to sunflowers. The similar soil conditions required by both plants and the tall sunflower stems cucumber vines love to climb give the fruit a sweeter taste. Some gardeners swear that planting by moonlight causes plants to grow faster and healthier than those planted during the day. Others advise tilling in the moonlight to better reduce weed germination. The right garden accent adds extra appeal and charm. Garden decor doesn’t have to be expensive. You probably already have something at home that would provide the perfect accent to finish the look of your garden. Do you have an old wooden chair in the attic? Rustic looking pieces of furniture placed in a corner area give the garden a whimsical look. Pieces of terracotta, perhaps from a broken flower pot, make great decorative borders and add an artistic flair.Flower pots, either empty or with plants, provide a decorative touch. Paint or mosaic the outside for added interest. Pottery pieces are another option.